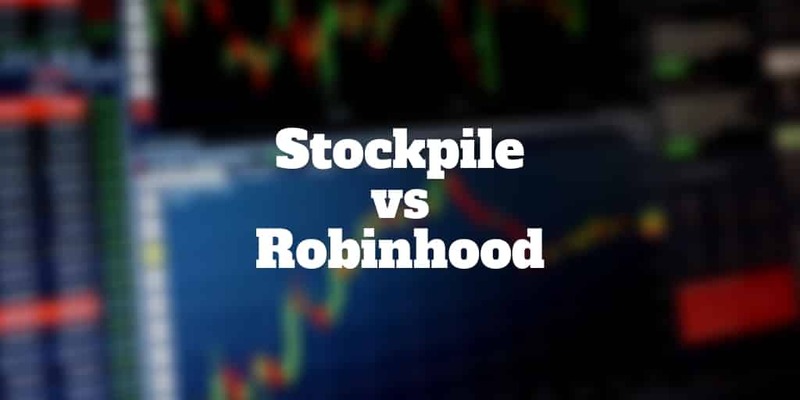 Robinhood vs Stockpile, which online broker is best? We compare these leading stock brokers to find out which has better commissions rates, investment minimums, account selections and more. Both brokers have innovative business models. Robinhood pioneered the idea of free stock trading while Stockpile combines a discount brokerage firm with a stock gift-giving service under one umbrella. If low trading costs are your top priority, Robinhood simply cannot be beaten. But if you prefer the idea of gifting shares of stock to your loved ones instead of giving the latest toy that will soon be tossed to the garbage, Stockpile is your best bet. Let’s take a closer look to see which online broker is best for you! Which Broker Is Best: Stockpile or Robinhood? Which Trading Platform Is Best: Robinhood or Stockpile? The Robinhood app is a commission-free trading platform. Literally, you can invest for free; no hidden fees will crop up to surprise you. Whether you buy or sell stocks, ETFs, or even cryptocurrencies, transactions costs are nil. Most brokers make money by charging clients who buy and sell securities. But Robinhood takes a different tack altogether. It makes money by selling customer orders to market makers. Every time you buy or sell, market makers pay Robinhood for customer “order flow”. Another way Robinhood makes money is by charging clients for its margin trading service, called Robinhood Gold. While Robinhood honors its promise to deliver free stock trading, it will charge users who wish to borrow funds. So if you plan to leverage your money to “goose” returns, you’ll need to pay a rate that depends on your borrowed amount. Lastly, Robinhood may earn interest on cash sitting in accounts. Stockpile is a discount brokerage firm that lets traders buy and sell stocks just as easily they would at thinkorswim, tastyworks, or TD Ameritrade. The twist in the Stockpile business model is anyone – not only clients – can purchase gift cards of stock. Both physical and virtual gift cards of stock are available to buy online or even at major stores like Safeway and Target. The same way you could buy someone a Starbucks gift card you could buy them a gift of Netflix stock or Amazon stock. The main difference is the Stockpile gift could last longer and grow in value over time. For parents, uncles, and aunts looking to teach their kids, nephews, or nieces about saving, investing, and putting money aside for a rainy day, Stockpile is an innovative solution. Stockpile is best for anyone wishing to gift stock to loved ones while Robinhood is ideal for fee-savvy traders who want to avoid commissions charges on stock, ETF, and cryptocurrency trades. There is no debating who comes out on top in the fees and commissions battle. Zero commissions on stock, ETF, and cryptocurrencies trades can’t be beaten – Robinhood takes home the prize. You will pay clearing fees still but those charges are outside of Robinhood’s control. And if you wish to borrow money to invest, Robinhood Gold is a fee-based service that requires approval to access. Commissions costs are rock bottom at Stockpile. It costs just $0.99 per trade to pick up shares of stocks like Alphabet or AutoZone. You can even buy stocks using a credit card but beware that an extra 3% credit card processing fee is tacked on to commissions charges. The cost to buy a gift card is $2.99 plus a 3% credit or debit card fee. So to give a $100 Nike gift card to your little nephew Joey, you would pay $105.99. A physical gift card that you can hand over in person (versus an electronic gift card you can e-mail) will cost you anywhere between $4.95 and $7.95. Neither Robinhood nor Stockpile is built with the frills you would enjoy at Schwab or Fidelity. Futures and forex traders will need to look elsewhere. Unlike Stockpile, which sticks with stocks and ETFs only, Robinhood goes a few steps further by supporting options trading and cryptocurrency trading too. Its options service is a little bleak compared to industry leaders, thinkorswim and tastyworks. For example, Robinhood doesn’t support market orders for options trades. And you won’t find anywhere near the same number of tools, screeners or scanners as those that top options brokers provide. Neither Robinhood nor Stockpile imposes investment minimums to open accounts. Unlike full-service brokers, Robinhood and Stockpile sacrifice account selection for a simple service offering. Both offer taxable accounts but Stockpile also offers custodials accounts so children can receive gifts of stock. ✅ Commissions and Fees: Zero commissions costs give Robinhood the victory in the battle of best broker for fees and costs. ✅ Give Stock Gifts: Want to give the gift of stock to loved ones? You don’t even need to be a client. Simply check out online to buy an e-gift card or at a local store to buy a physical gift card. ✅ Cryptocurrency Trading: Unlike Coinbase, which charges hefty commissions costs for trading Bitcoin, Ethereum, and Litecoin, Robinhood charges zero commissions. ✅ Account Selection: Both companies offer taxable accounts but only Stockpile caters to custodial accounts. ✅ Easy To Use: The Robinhood app is intuitive even for stock market beginners. ✅ Credit Card Purchases: Unlike most brokers, who require cash deposits to buy stock, Stockpile permits clients to buy stocks using credit cards or debit cards. ✅ Mobile Trading: Robinhood is compatible with iOS and Android mobile devices. ✅ Investment Minimum: It’s a tie on investment minimums with both Robinhood and Stockpile allowing clients to open accounts without making a minimum deposit. For fee-savvy traders, Robinhood and Stockpile are both low cost trading options but nothing beats free and Robinhood takes the prize with zero commissions charges on stocks, ETFs, and cryptocurrencies. Where Stockpile shines brightest is its support of stock gifting. Clients and non-clients can buy gift cards of stock for loved ones. Stock gifts can be bought virtually online or physically in stores. Neither broker does a particularly good job of catering to advanced traders, so if screening tools are important to you or you plan to actively trade futures or forex, you’ll need to look elsewhere. However, both offer trading platforms that are easy to use and very intuitive. If you’re a stock market beginner or simply fee-sensitive, Robinhood is best. If you want the added bells and whistles of gift-giving, Stockpile is the better match.